You can export both items and milestones in a roadmap to a CSV file for use in an external application. Items and milestones are exported separately. When exporting items, you can choose to export the subset of items in the selected view resulting from the view's filter set OR all the items in the roadmap. 1. In the View dropdown on the Roadmap navbar, select the view with the subset of items you want to export. 2. On the View navbar, click the Export icon. 3. In the Export dropdown, click Export Items to CSV. NOTE: If you're in the Items Table, click Export to CSV. Make sure you're not in the Milestones Table or you'll import the view's milestones by mistake. 1. In the View dropdown on the Roadmap navbar, select All Data. 2. On the View navbar, click the Items icon. IMPORTANT: You must be in the Items Table to export all items. If you're in the Milestones Table, you'll export milestones instead. 3. On the View navbar, click the Export icon. 4. In the Export dropdown, click Export to CSV. Like items, you can choose to export the subset of milestones in the open view resulting from the view's filter set OR all the milestones in the roadmap. NOTE: You can only export milestones in a view with a Timeline. To export milestones, follow the same steps above but select Export Milestones in the Export dropdown instead. All item and milestone fields are exported as columns in the CSV using field names for the column headers. Items and milestones are exported as rows, one row per item or milestone. Internal ID. This ID is used to match the items or milestones in Roadmunk in case you want to import the exported items back into Roadmunk after editing them in an external application. External ID. Items or milestones in the CSV will have an External ID if they were originally imported to Roadmunk from an external application such as JIRA. The ID is used to match the items or milestones in the source application in case you want to re-import the exported items or milestones back into the source application after editing them in Roadmunk. Source. The Source field contains the name of the roadmap from which you exported the items or milestones. 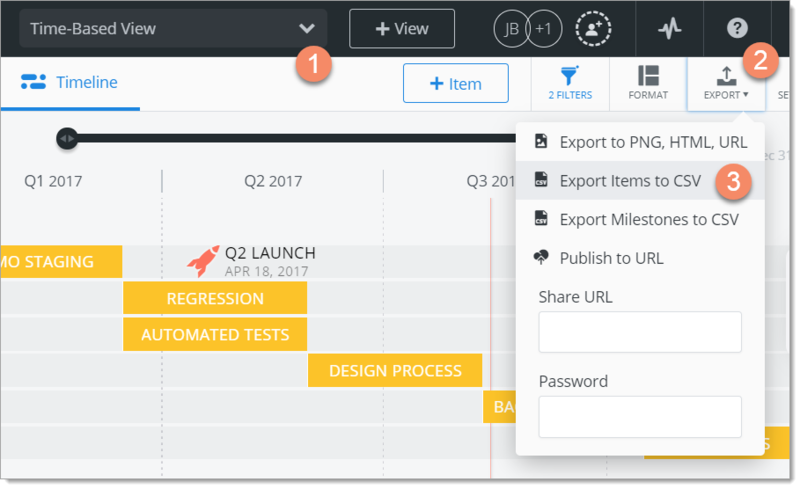 This field allows you to merge and work with items or milestones from different roadmaps while still being able to separate them. Bucket. If an item has the Date field set to a Bucket (e.g., Soon, Future) instead of an actual date or date range, the Bucket will be exported in this field and the item's Start Date and End Date fields will be empty. Who can export items and milestones? You can export a roadmap's items or milestones to a CSV file if you are the roadmap Owner or the roadmap has been shared with you as an Editor. If you share the roadmap as a Viewer, you can't export any of its items or milestones. When exporting a Master, only Account Admins may export to a CSV regardless if they have explicit permission on the Master roadmap.